Family owned and operated Left Coast Estate has been built and guided by two essential principles: a passion for winemaking and a deep connection to the land where we live and farm. Founded in 2003, we completed the initial phase of the winery just in time for the inaugural 2004 vintage of our label bearing a Lewis and Clark map, illustrating our special place in the world. 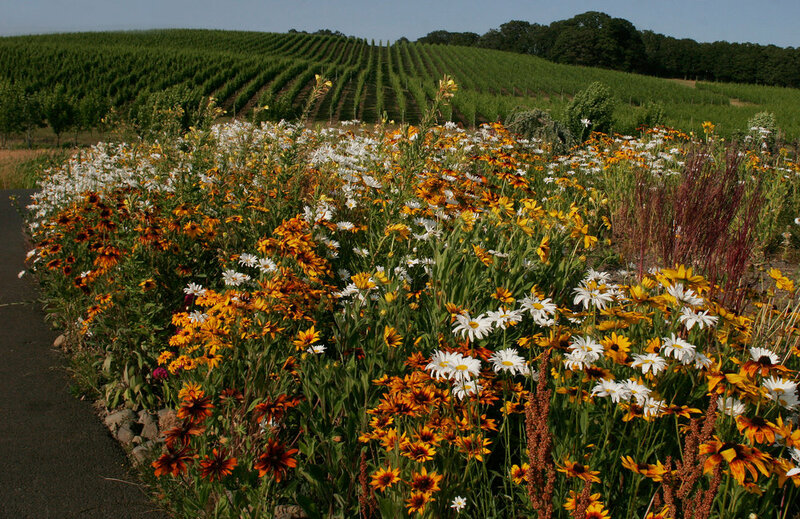 We are in the middle of the Willamette Valley, just 37 miles from the Pacific Ocean with the immense, cooling benefit of the Van Duzer Corridor running through the property. In the fifteen years since our beginnings, we have gone from a largely grape growing operation with long term contracts with fellow Oregon producers, a wonderful opportunity to establish the high quality of our fruit, to an all Estate commitment. We farm nearly 160 acres of vines on our 500 acre Estate, largely sedimentary soil laid down by the Missoula floods and some volcanic soil as well. We grow and meticulously tend our vines and grapes, handcraft our wines and bottle them on site, a fusion of art and science, most certainly a labor of love. We take a holistic approach to everything at Left Coast, sustainability being at the core of all we do. We received the largest USDA grant in Oregon in 2008 to go solar, and the vast majority of our estate's electrical needs are supplied by the ground and roof mounted solar arrays. Our winery and vineyards are LIVE certified, Salmon Safe, and we were one of just six producers that went to a third party verification in the initial Carbon Neutral Challenge, originally under the aegis of the Governor's Office, now folded into LIVE as a Carbon Reduction program. Younger son, Taylor Pfaff, stepped into the CEO position the summer of 2016. He brings the experience of 6 harvests in the cellar under the excellent mentorship of Winemaker Joe Wright, along with a MBA in Wine and Spirits from the Kedge Business School of the University of Bordeaux. His sister, left handed Cali (three of five in our family are left handed, part of the Left Coast story) after whom our Cali's Cuvee Pinot Noir is named, began the map you see when she was yet in high school. Now, a licensed Landscape Architect, she is currently involved in the development of a master plan for the parks of Vancouver BC. She, of course, has had a significant impact, with much more to come, on what has been described, to our delight, as the park like setting of our property, complete with a hiking trail. Daughter in law Christina is involved in a Master's program in Hydrology and Watershed Management at Portland State. She has been the driving force behind our annual Run for the Oaks. Everything we make that day goes into our oak savanna restoration project. In the past two years, partnered with the USDA Department of Fish and Wildlife, we have cleared the invasive understory of 40 acres of old growth oaks at the center of the property, seeding with indigenous plantings. There we dealt with the more than 300 year olds. Now we will be looking to preserving the "juvenile" 60 year olds as well! There are only an estimated 3 percent of the original oaks remaining in the Valley. As charter Members of the Oak Accord, our intention is to actively do our best to maintain these treasures of nature for generations to come. The Willamette Partnership has recently featured Left Coast as the filming site for an educational video on this topic. The older generation, too, is happily found in the Tasting Room or out in the market, founding matriarch Suzanne Larson serving as Brand Ambassador. At home at Left Coast, there are chickens, ducks and large organic and flowering gardens to tend and enjoy. Life on a big working farm, with our wines at the center of it all, a greenhouse to supply our kitchen going in now and pollination garden for our bee population on the drawing boards. It's a wonderful life. In our winery, the 62kW roof-mounted solar installation generates the vast majority of our electricity. Our 17-acre spring-fed lake collects rain water for our gravity-fed irrigation. Additionally, we offer a Bottle Recycling Program for our customers: For every empty Left Coast Estate bottle that is returned to our tasting room for recycling, we will take $1 off each new bottle purchased. Left Coast is home to 8 different hives of honey bees. Each hive is contained in several supers. A honey super consists of a box in which 8-10 frames are hung. Honey bees collect nectar and store the processed nectar in honeycomb, which they build on the frames. When the honeycomb is full, the bees will cap the comb with beeswax. Every fall we will take the full honey supers and extract the honey. In 2012 we yielded nearly 100 pounds of honey. The honey is then bottled in mason jars, sometimes with honeycomb. From there it is sent to the winery to be used in our Queen Bee Bubbly. The honey processing gear is left outside as the bees will salvage all unused honey and wax. Taking it back to the hive one mouthful at at a time.